Manny Ortiz shot over 30 weddings with the Sony α7R II last year. 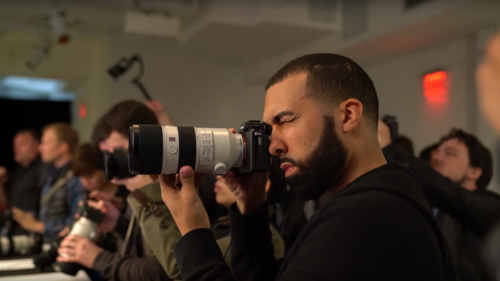 As part of the Sony Alpha Imaging Collective, Manny was invited to the launch of the new Sony a9 in New York and he immediately saw the potential the camera holds for wedding shooters. We spoke with him to get some of his thoughts on why. Alpha Universe: You photograph weddings, portraits and a lot of other different things. And you also have a growing YouTube channel. And as a Sony convert, you’ve been talking a lot about the Sony cameras, especially on YouTube. Manny Ortiz: I was shooting Canon and about 2 years ago, I switched to Sony. I switched because I saw the progression in technology. The electronic viewfinder is what really intrigued me. I was watching Jason Lanier’s videos. He is the main reason why I switched. I seen that you could see the what the photo would look like before you take it. I thought to myself, this is a no brainer. Test shots are a thing of the past. You can just nail the exposure in one shot. That's what really intrigued me. As I did more with them, I started getting a lot of questions from people on my YouTube channel about the Sony cameras. They were asking about batteries, menus, things like that. And when they saw my videos around the α9 launch, the questions really started coming in. Questions about the battery, the speed and buffer of the camera, the ergonomics, the dual SD card slots, the autofocus in low light. Those are the main things that they want out of the Sony system and I think the A9 has pretty much answered all of those concerns. Alpha Universe: In your first video review that you did with Max Yuryev, you mentioned that the launch had a lot about sports and photojournalism, but you thought one of the best uses of the α9 is for wedding shooters. Why do you think the α9 is going to be a particularly good fit for wedding photography? Manny Ortiz: Well, like I said, when it comes to what some people have felt like were shortcomings in the Sony system for weddings. Things like the battery situation. The fact that the battery in the a9 is more than double the life is going to be a huge incentive for people to shoot with the α9 for weddings. Then there’s the speed and buffer. Now, some people may say or ask, "Why would I need 20 frames per second to shoot a wedding?" If you are familiar with weddings, there are a lot of spontaneous moments, especially when they're coming down the aisle is one. When they're walking down the aisle, you get some of the best expressions out of the bride and groom as they're walking down. When they look at each other, they're looking at their family and friends to the side. It’s easy to miss those moments because they’re in-between moments. That’s where 20 frames per second is going to be huge. When you're doing the bridal formals. Let's say you do a jumping shot with the group, I think at 20 frames per second, it’s going to nail that. Usually I would reach for my a6500 to get the frames per second and nail that shot where everyone is in the air perfectly. With the α9’s 20 frames per second, I’m going to nail that shot. I think that speed is a big pro when shooting with the α9 for weddings. When it comes to the ergonomics, I could tell you that personally, I miss the joystick on my 5D Mark 3 and I've heard the same from other people. Now that Sony included a joystick is huge. It's one of the little details, but it's a huge thing when you're working. As far as the dual SD card slots, I know a lot of wedding professionals really like having dual SD card slots for the redundancy. That's another big bonus. When it comes to the low-light auto focusing, I actually had hands-on experience with the camera when I was in New York. I was focusing on other things in low light to see how it would pick up subjects, and it did a great job. I think that the focusing is at least on par with a DSLR, in terms of low light auto-focusing. Alpha Universe: When it comes down to it, sports and weddings actually have a lot in common. In sports, you've got one chance for most of the shots to get it right. There’s only going to be one first dance. They only come down the aisle the one time. You can't just jump out and say, "Stop. Can you walk back and let's do that again? "Just like in sports and weddings, when you're a professional, you can't miss. There is no excuse Your client isn't going to say, "That's okay. We understand." The bride is not going to understand. If you're a sports photographer, your editor is not going to understand. Manny Ortiz: Yeah, I think that will be a huge selling point with the α9. I know the launch was all about they wanted to gear it towards the sports industry, but me, not being a sports photographer, I was thinking about weddings. I think the wedding DSLR shooters out there that have been curious about the mirrorless system, I think that this will be the one to push them to make a switch. This camera is comparable to the 1DX and the D5. This is going to be a great all-around beast.